When buying or selling property or financing construction. We provide services for sales, refinances, and construction disbursing. In addition, we offer qualified intermediary services for 1031 exchanges, witness closing and document preparation services. For most people, the purchase of a home is the single largest investment they will ever make. Title Insurance provides peace of mind by protecting the buyer from a host of prior or hidden defects. Without title insurance a title defect could force a buyer spend substantial sums on legal defense that could still result in the loss of the property. 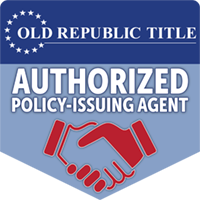 Owners Policies of Title Insurance protect against specified title defects and cover the cost of legal defense of title, for any covered matter, up to the amount of the policy limit. My lender requires Title Insurance, doesn’t that protect me too? There are two types of title insurance. One is the lender’s Policy that a buyer is required to purchase when obtaining a mortgage loan. This policy only insures the financial institution. It does not protect the buyer. The other is the Owner’s Policy that protects the buyer from title defects up to the amount of the policy. How much do Title Services cost? The one-time premium is directly related to the value of the property. Our online calculator can provide an accurate quote and the cost is often less than an annual auto insurance premium. Once purchased, the policy protects the insured buyer for as long as the buyer owns the property. Once the offer to purchase is signed by both buyer and seller it is delivered to the title company. The settlement agent starts the closing processing by opening a title order. The Title search and Examination is the next step in the process. A search is made of public records and includes searching deeds, mortgages, assessments, liens, wills, and taxes. The examiner then does an examination of the search and issues the title commitment. The title commitment is sent out to all parties for review. The settlement agent then gathers all information such as mortgage payoffs, homeowner’s fees/dues, lenders closing instructions, commissions, etc., prepares all closing documents and schedules the closing. Real estate tax prorations are calculated. Next is the closing of the transaction. The seller, buyer, settlement agent, lender and real estate agents are all often present. The seller signs the deed and closing affidavit. The buyer signs their lenders closing package. Both parties sign other necessary closing documents. After the signing has been completed, the settlement agent will pay all parties who performed services in connection with the closing. The transaction documents are recorded in the county in which the property is located. The title insurance policies are then prepared and sent to the lender and new owner.